. kinu 絹　silk in Japanese culture .
. Dunhuang 敦煌 Tonko Oasis and Buddhism . A lot has been written about the importance of the Silk Road and Japanese culture. Here I will concentrate on the Heian period . 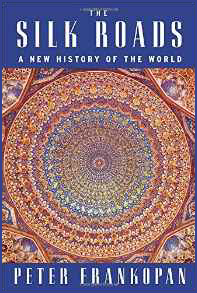 . . and the latest developments since 2015.
is a network of trade and cultural transmission routes that were central to cultural interaction through regions of the Asian continent connecting the West and East by merchants, pilgrims, monks, soldiers, nomads, and urban dwellers from China and India to the Mediterranean Sea during various periods of time. is a cooperative project among countries in Asia and Europe and the United Nations Economic and Social Commission for Asia and the Pacific (ESCAP), to improve the highway systems in Asia. It is one of the three pillars of the Asian Land Transport Infrastructure Development (ALTID) project, endorsed by the ESCAP commission at its 48th session in 1992, comprising Asian Highway, Trans-Asian Railway (TAR) and facilitation of land transport projects. is a development strategy and framework, proposed by People's Republic of China that focuses on connectivity and cooperation among countries primarily in Eurasia, which consists of two main components, the land-based "Silk Road Economic Belt" (SREB) and oceangoing "Maritime Silk Road" (MSR). The strategy underlines China's push to take a bigger role in global affairs, and its need to export China's production capacity in areas of overproduction such as steel manufacturing. China has gone about staking its territorial claims in the South and East China seas has obscured its growing interest in the Indian Ocean. This ocean has become the new global center of trade and energy flows, accounting for half the world’s container traffic and 70 percent of its petroleum shipments. is about expanding and securing maritime routes to the Middle East and beyond through the Indian Ocean, which is the bridge between Asia and Europe. Xi’s dual Silk Road initiatives — officially labeled the “One Belt, One Road” — constitute a westward strategic push to expand China’s power reach. Indeed, Xi’s Indian Ocean plans draw strength from his more assertive push for Chinese dominance in the South and East China seas. maneuvering in the Indian Ocean — part of China’s larger plan to project power in the Middle East, Africa and Europe — aims to challenge America’s sway and chip away at India’s natural-geographic advantage. 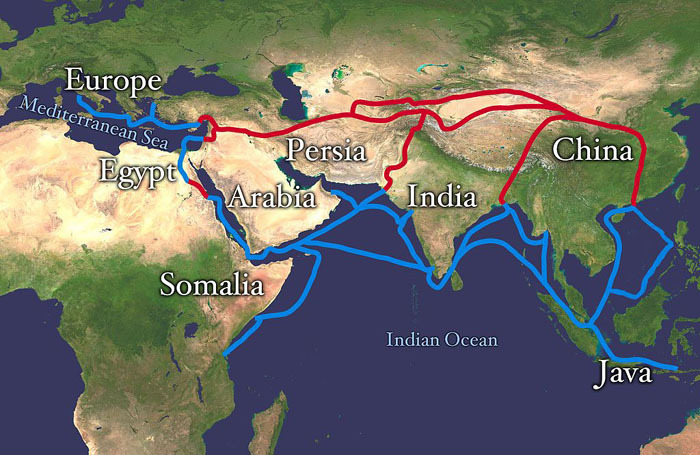 Xi has sought to carve out an important role for China in the Indian Ocean through his Maritime Silk Road initiative, while his overland Silk Road is designed to connect China with Central Asia, the Caspian Sea basin and Europe. between the two mega Silk Road projects is Pakistan, which stands out for simultaneously being a client state of China, Saudi Arabia and the United States — a unique status. Xi officially launched the project to connect China’s restive Xinjiang region with the warm waters of the Arabian Sea through a 3,000 km overland transportation corridor extending to the Chinese-built Pakistani port of Gwadar. This project makes Pakistan the central link between the maritime and overland Silk Roads. The Xi-launched corridor to Gwadar through Pakistan-held Kashmir — running in parallel to India’s Japanese-financed New Delhi-Mumbai Industrial Corridor — will hook up the two Silk Roads. a stable Pakistan has become so critical to the ever-increasing Chinese strategic investments in that country that Beijing has started brokering peace talks between the Pakistan-backed Afghan Taliban and Kabul. This effort has been undertaken with the backing not just of Pakistan but also of the U.S., thus underscoring the growing convergence of Chinese and American interests in the Afghanistan-Pakistan belt. while seeking to co-opt strategically located states in an economic and security alliance led by it, is working specifically to acquire naval-access outposts through agreements for refueling, replenishment, crew rest and maintenance. Its efforts also involve gaining port projects along vital sea lanes of communication, securing new supplies of natural resources, and building energy and transportation corridors to China through Myanmar and Pakistan. to its ongoing negotiations for a naval base in Djibouti, the maritime domain has become central to Xi’s great-power ambitions. Yet it is far from certain that he will be able to realize his strategic aims in the Indian Ocean Rim, given the lurking suspicions about China’s motives and the precarious security situation in some regional states. Auspicious symbols were used as art motives, many coming from China. In the Jomon period (ca.12,500-200 BCE) ceramic vessels were decorated with impressed motifs, usually rope patterns (whence the term "Jomon" - "rope pattern"). In the Yayoi period (200 BCE-ca. 250 CE), the art of throwing pottery on the wheel reached Japan from China via Korea, and new designs appeared - zigzags, triangles in saw-tooth patterns (tasuki), whirlpools, and complex abstract linear designs. In the Kofun period (250-552) metal wares were embellished with motifs that had also come to Japan from China, such as dragons, or the four deities representing the four winds of heaven - the green tiger of the East, the white tiger of the West, the red phoenix of the South, and the black tortoise-snake of the North. Other motifs included people, horses, wagons, jewels (magatama; semi-precious comma-shaped stones), animals and birds. As of the 6th century CE, decorative motifs from East Asia, especially of the Chinese Tang era (618-907) appeared. Through China, by way of Korea, there arrived motifs from the Buddhist art of India, from Persia, and from Rome's Eastern Empire, as well as from Central Asia along the Silk Road. Influenced by Chinese paintings of the Tang period, designs incorporated sacred sites (alamkara), such as the buildings and gardens of the "Western Paradise" of Buddha Amida, as described in the Buddhist sutras. In the Asuka period (552-645), the flowering honeysuckle (nindo) was frequently represented as an arabesque (karakusa; "Chinese grass"), a rhythmic decoration with many variations, seen on the haloes of Buddhist sculptures, or embellishing roof-tiles. This motif apparently came to the East from Greece. 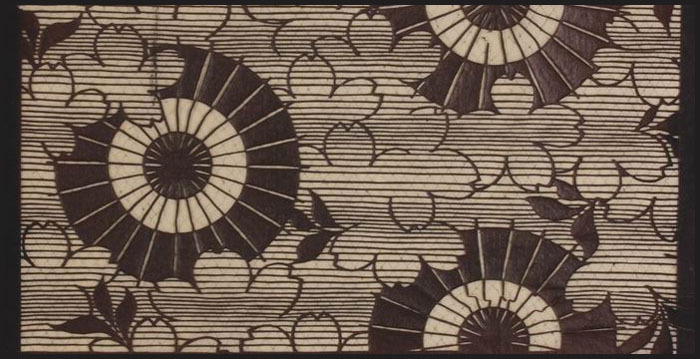 Also during the Asuka period, other decorative motifs reached Japan from the mainland - such as the lotus flower, clouds, and four-petalled blossoms. During the Nara period (645-794), contacts with the mainland increased. With China there was direct contact, and the capital city of Nara was modelled on the Chinese capital, Chang-an. 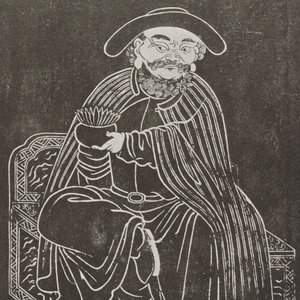 In 756, after the death of the Emperor Shomu, his widow transferred more than 600 items he had collected to the Shosoin Treasure House in the Todaiji Temple, together with a detailed catalogue. Many of the items in this collection were brought to Japan from China and Persia, and some were made by Chinese and Korean artisans who had come to Japan, or by local artists. Even though the Chinese influence is evident in the Japanese works, there is also a dynamic integration of decorative elements from the mainland and from Japan itself. At the beginning of the Heian period (794-1185) the Nara motifs derived from the decorative arts of China were still very prevalent in Japan. However, long-tailed birds, the moon, the sun, and landscapes, all ornamented with gold and/or silver also appeared. Artists began applying gold leaf (kirikane) to surfaces, such as clouds floating the sky, and the style became more painterly. They also used inlays of various materials such as mother-of-pearl and precious metals. The use of lacquer as ornament also increased. At this time the Phoenix Hall in the Byodoin Temple was embellished with colourful representations of imaginary flowers, from floor to ceiling. Here, designs of hosoge karakusa and lotus flowers are painted in rhythmic sequences or in random patterns that appear to be almost symmetrical. These decorations are very colourful, applied in gradations of colour (ungen saishiki) that had already been seen in the Asoka period, lending the two-dimensional designs a sense of depth. Ishi-datami (tile patterns) were still very prevalent in the Heian period, but at the end of the Chinese Tang era official contacts between Japan and China ceased until the 15th century. So that decorative motifs with local character were developed in Japan. The patrons of art at that time were the aristocrats who lived in Kyoto, the capital, and the artists decorated practical items (tsukurimono), intended for the festivities of the cultural elite, with great elegance and finesse (furyu). It is apparent from these works that the nobility preferred naive motifs derived from nature, such as birds flying over a field. As a rule, these scenes embellish inlaid lacquer wares. Another popular design of the era was the wheels of a wagon floating amid waves, derived from the custom of soaking the wheels in water to prevent the wood from drying out. This motif often appeared on paper for writing poetry, for fans, or for copying sutras. 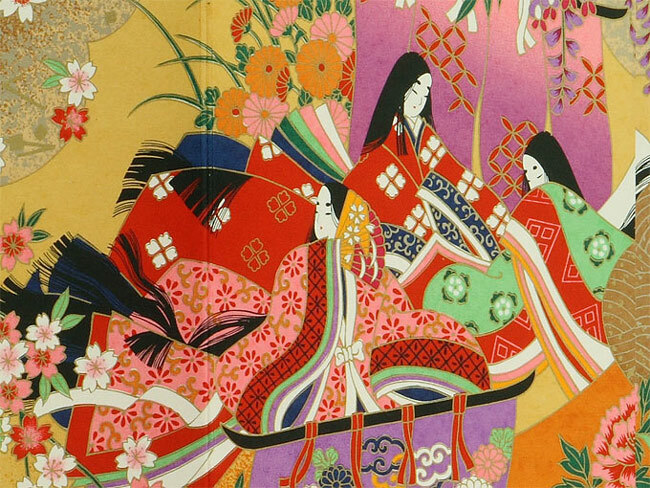 The designers of the Heian period certainly loved painting creatures (butterflies, dragonflies, birds, hares) and plants (wisteria, pampas, maple, plum, cherry), as well as motifs from earlier times. The aristocracy were fascinated by the changing seasons of the year, and seasonal plants were used for decoration - chrysanthemum, akigusa (autumn flowers and foliage), reeds, willow fronds, bamboo or melons. Lions or phoenixes were painted inside medallions, and waves or misty effects were created with powdered silver or gold (sunagashi), rows of kikko (rows of hexagons like tortoise-shell), lozenges, and marbling effects were created by spraying ink onto wet paper (suminagashi). At the beginning of the 12th century, new motifs appeared - the tomoe (comma), miru (seaweed), and maple leaves (kaede). A modified form of the medallion (ban-e) was used mainly on textiles and furniture, incorporating a lion inside a circle, and was also the basis for family crests , developed later. Textiles with diagonal stripes were preferred to Chinese embroidery. "In Japan there are paintings, but we do not know the names of the artists who painted them. These works depict the landscape and natural scenes of their homeland. They use thick layers of pigment, and much use is made of gold and primary colours. They do not portray true reality, but are paintings full of colour, dazzling to the eye in their glowing beauty". At the end of the 12th century, the political power of the aristocracy was superseded by the Japanese Army, and the seat of government was transferred to Kamakura in the east of the country. The emperor and his court remained in the Heian capital (today Kyoto), the centre of culture.
. Tikotin Museum of Japanese Art - 2003 . 2008 Program for Teaching East Asia, University of Colorado. 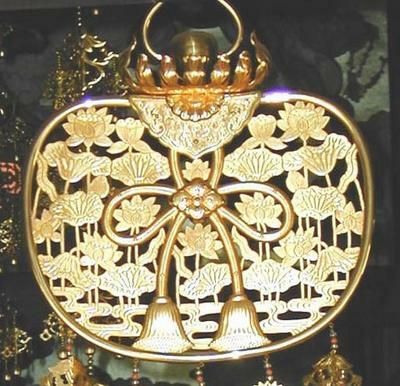 Since the Heian period gilded bronze was often used.
. keman 華鬘 flower garlands, flower hangers . An auspicious motive bringing long life and good luck, often used for New Year dishes. Also used on paper for fusuma sliding doors.
. tsuru 鶴 The Crane in Japanese Poetry . One of the festivals of the Onmyodo practise. Celebrated since the late Heian period, going on in the Kamakura and Muromachi period. Dedicated to the supernatural phenomenon in general. Now also as a Manga.
. Abe no Seimei 安倍晴明 (921 – 1005) .
. Doosojin 道祖神 Dosojin, Dososhin - Legends about Wayside Gods .
. Gozu Tennō Densetsu　牛頭天王　伝説 Gozu Tenno Legends . More legends in the list of personal names. Once upon a time in the Heian period . . .
. yao bikuni 八百比丘尼 a nun for 800 years .
. Tengu Hookiboo 伯耆坊 Hokibo, Hoki-Bo .
. Sutoku Tenno, Sotoku 崇徳天皇 (1119 - 1142) . 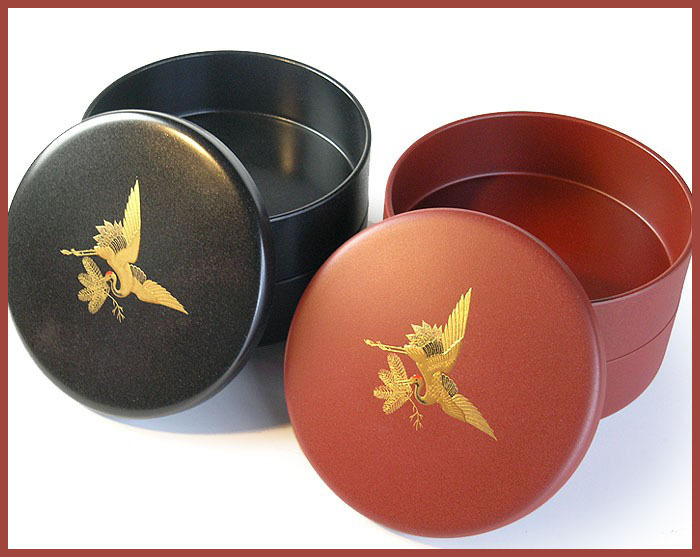 During the early Heian period, 陽成天皇 Emperor Yozei opened a box with a seal of the Gods. At that time a white cloud escaped from the box. was the 57th emperor of Japan. - 877 (Gangyō 1, 6th month): There was a great drought; and sacrifices were made at the temples of Hachiman, Kamo and other temples in Ise province. Eventually, it rained. - 884 (Gangyō 8, 1st month): The extravagant and dangerous habits of the emperor continued unabated. - 889 (Kanpyō 1, 10th month): The former emperor Yōzei was newly attacked by the mental illness.
. Joozoo, Jōzō 浄蔵 Jozo (891 - 964) . Legends about monk, priest of the Tendai sect, Mid-Heian Period. seirei, ikiryoo, shooryoo, ikisudama 生霊 "living spirits"
They have been especially feared at the court in Kyoto.
. Ikiryō, ikiryoo 生霊 . 生き霊 Ikiryo“living spirit” .
. Natori Rojo 名取老女 The Old Woman from Natori . In the Heian period, 小野篁 Ono no Takamura was exiled to Iki Island. There he fell in love with the beautiful 阿古那 Akona. When he was allowed to go back to Kyoto, he left her wooden two statues featuring the both of them. They seemed to help with toothace and were later seen as Jizo Bosatsu. They also helped with other pain, for example during pregnancy. Even today, there are many letters of gratitude.
. Agonashi Jizo 腮無地蔵 Jizo without a jaw or chin .
. 小野篁 Ono no Takamura - (802 - 853) . Once a robber stole the Heian Butsu Buddha from the Heian period. He carried it out of the temple hall, but kept walking in circles around the temple garden, never being able to exit it. Thus the statue was not lost after all. 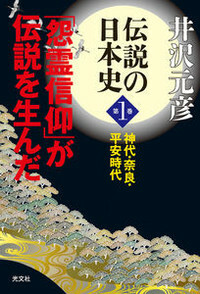 Here are two hundred and twenty dazzling tales from medieval Japan, tales that welcome us into a fabulous, faraway world populated by saints and scoundrels, ghosts and magical healers, and a vast assortment of deities and demons. 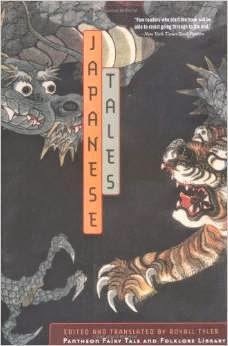 Stories of miracles, visions of hell, jokes, fables, and legends, these tales reflect the Japanese worldview during a classic period in Japanese civilization.